In walking distance of ALL Amenities, No car 🚗 required. Blue Haven Villa is a beautifully appointed, fully self-contained one bedroom villa, with its' own private entrance and parking. It is centrally located in a quiet residential South Coast neighborhood, which is ideally situated directly opposite the renowned Accra Beach (Tiki Bar), and the South Coast Board Walk with its' stunning sunsets. The bedroom is spacious with large built-in closets and mirrored dresser. Air-conditioning and/or ceiling fan is provided as your choice of cooling, with a queen size bed and complimentary furnishings to make it complete. Like wise, the bathroom has its' own tasteful decor. The kitchen area is fully equipped with all you will need for your self-catering holiday: refrigerator, stove, microwave, coffee-maker, toaster, cooking utensils, crockery and even laundry facilities. A counter area with stools is provided for your casual holiday dining, all of which is cooled by a ceiling fan. The living area is comfortable with a ceiling fan for cooling and satellite television for your entertainment. The patio area is comfortable with a bistro set for additional dining and is cooled by our beautiful trade winds, especially during the winter season, December to May. 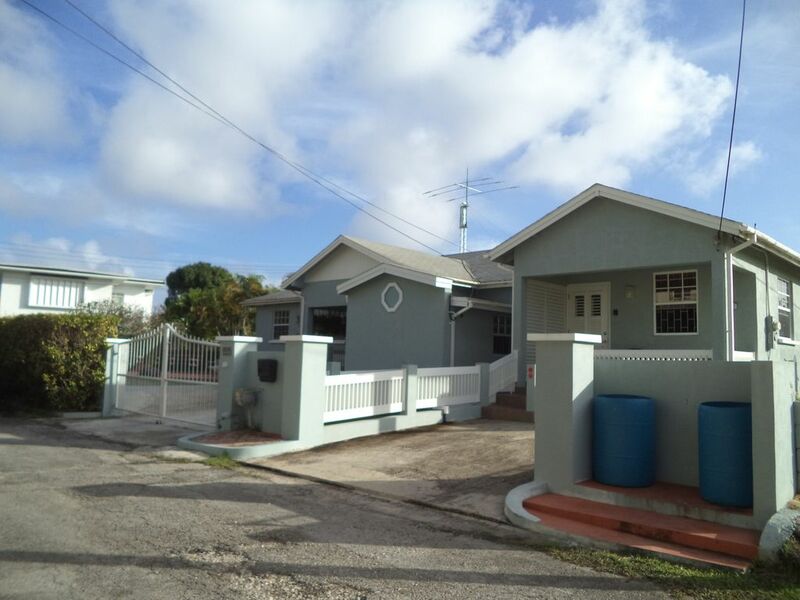 This villa is within walking distance of ALL amenities, Public Transport, Supermarkets, Post Office, Banks, Doctor’s Office, Pharmacy, Duty Free Shopping, Restaurants, Bars and Night Life, and is approximately 4 miles from the Capital City of Bridgetown, in a westward direction. Along the way, by foot 👣, bus 🚌, or car 🚗 you will pass the renowned Barbados Fertility Clinic, (opposite Hastings Rocks on the Boardwalk), the Garrison Savannah (horse racing track), the Garrison Tunnels (tunnels used in the World Wars), George Washington House (the US President’s accommodation on his visit to Barbados), as well as fun beach facilities, such as the Boat Yard or popular night life at Harbour Lights. In an eastward direction, you will find the renowned St Lawrence Gap (hub for dining and night life), Oistins (Oistins Fish Fry), Miami Beach, and South Point (Freights Bay surf spot). So, the need for a car would be for the scenic view of the island and its attractions, which is highly recommended! Please ask, if you have any queries on accommodation rates or specific requirements or location. I am Carey and my lovely wife is Wendy. We are a couple of 30 years marriage with one grown son, who presently resides in Canada. I am from the 'The Land of Many Waters, Guyana, South America and my wife is a born 'Bajan'. We live on the property and enjoy the location for the convenience of being able to go for our week-end walks on the beach and board walk. We will be delighted to have you as our guest, so that you too can experience this beautiful island, that we call 'Home'. We built our home on this property for its' location, location, location to all amenities, especially the beach. No need for a vehicle. Very centrally located. WiFi access throughout the villa. Safe provided to store your valuables. Key Lock Box provided to store key when you don't wish to take it with you to the beach, etc. Stayed at the beautiful Blue Haven Villa for 2 weeks as our belated honeymoon. The hosts were fantastic, friendly and very helpful. Which is great because they live next door. In fact, Carey even took us to the local supermarket to stock up on supplies for our stay and showed us around Rockley a little to get our bearings. The place is a cute little one bedroom and was very nicely kept. Linens etc were all very clean. The location was so good, we didn't miss not having a pool when we were within easy walking distance to the beach. Rockley and the nearby Carlisle beach were our favourite of all the beaches we visited. You are also just a short $2 bus ride to Oistins for the Friday fish-Fry or Bridgetown if you want to hit the big schmoke! We look forward to visiting Barbados again, and we hope Wendy, Carey and the cutest dog Buttons! would welcome us back as guests at there wonderful villa. The villa is pristine, and true to every photo with every amenity needed for a great vacation. Carey and Wendy were wonderful hosts and we thoroughly enjoyed meeting and chatting with them. Loved the morning hellos from the friendly Buttons as well!! We would not hesitate to stay with them again. Location is fantastic, not too close to busy streets but close enough that quick walk gets you to beach and boardwalk . I can say for certain that a return visit to Blue Haven Villa is in the future! I rented Carey and Wendy's beautiful villa from March 24 - April 7, 2018 and couldn't have made a better choice. The villa is absolutely pristine, modern, quiet, with high quality linens, silent ceiling fans, a very comfortable bed, a well equipped kitchen, and large windows that offer good cross-breezes. The property is perfectly located: 200 meters to Rockley Beach (aka Accra Beach) and the main road where numerous shops, restaurants and services (pharmacy, convenience store, etc.) can be found. Bus and minibus stops for easy access to Bridgetown or Oistins (which are only a few kilometers away) are also right there. Access to the wonderful South Coast boardwalk is just at the northern end of Rockley Beach, where you can run, walk, stroll or simply sit and soak in the beauty of Barbados, or enjoy friendly banter with locals or other visitors. The Rockley Golf Course is walking distance from the villa; grocery stores are also close by, as is the Hastings Farmers Market every Wednesday, Saturday and Sunday. Carey and Wendy were wonderful, friendly, attentive, and helpful hosts from my very first contact before booking the villa right through to the end of my stay. Carey took me grocery shopping on my first day and offered helpful advice on local brands. I chose Blue Haven in large part based on its five-star rating and positive reviews, and both are absolutely well deserved. I highly recommend this property and will definitely stay here again when I return to Barbados. Thank you for a great stay Carey, Wendy and Buttons!!! We loved this villa and Barbados. We found the villa very comfortable and convenient. The villa was extremely clean and up to date. Nice kitchen and bathroom with nice shower. It was also nice having air conditioning in the bedroom to make for a comfortable sleep.The villa was a short walk to a very nice beach and we were able to walk to restaurants and stores. The owners were very nice to talk to giving us suggestions for things to see and do and were always available to answer our questions. Would definitely stay again. My husband and I stayed in the Villa for a week before moving to the House when my mom came down to join us. Location was unbeatable, within minutes walking to Rockley Beach (which we thought was the nicest beach). Tucked in to a quite neighborhood but within 3 minute walk you could be at the beach, several different restaurants, convenience store, bank machine, juice bar, clothing shops, liquor store and ice cream shop. The owners, Wendy, Carey and Buttons were excellent hosts! They live on site and were always available to answer a quick question or have a chat. We now consider them friends and next time we get to Barbados will be staying here again!